This month we’ve got a (relatively) short and sweet round-up for you. One game released and twenty-four fonts, plus some news on our ongoing work on other games. On the 27th, just in time for Halloween, we released The Mystery of Bockston House on Android and iPhone. Solve the case of a wealthy husband and father murdered in his own home. Go from room to room of Bockston House asking questions and looking for clues. 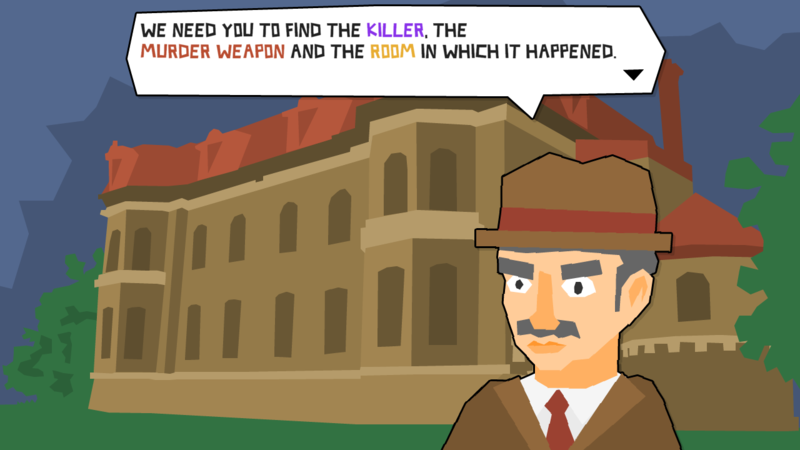 The killer, weapon and location are all randomised at the start of each new game for endless murder-mystery fun. The game was created for inclusion in GameDevDan Vs Life, which is coming to Steam soon. Remember if you want to use our fonts commercially you can buy licenses here or font packs here. We’re still working hard on a number of projects in the background. Dan is working on GameDevDan Vs Life, and has now completed 49/50 games (!). There’s still one last game to make, some changes to the launcher and a whole lot of testing to be done, but it’s looking good for a late 2017-early 2018 release window. As announced in September, NAL has been working on Maddening Euphoria, the latest game in the Maddening series. We expect it to release THIS WEEK on steam, so keep an eye out for it! Other than that we’re sure to have some Christmassy fonts and games up our sleeves ready for release before December. Just follow us on Twitter for the latest news!